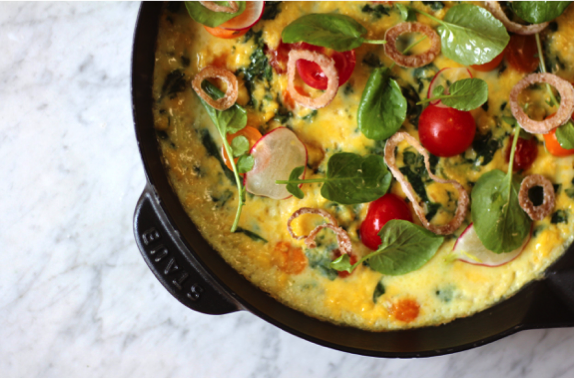 In a large mixing bowl, mix eggs, salt, pepper, mozzarella, spinach and cherry tomatoes. Pre-heat a 10 inch oven-safe skillet on medium-high. Add butter into the pan and let it melt/foam all around. Pour egg mixture into the pan and stir it around, to let it be evenly distributed throughout the pan. When the timer beeps, take it out and serve. Optional) Garnish with lightly-coated fried onions, watercress and radish salad.